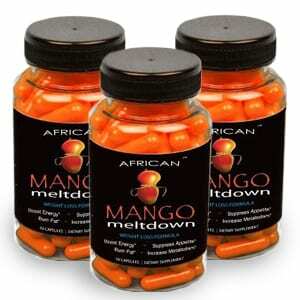 Should You Add African Mango Meltdown to Your List of Diet Pills to Try? Does African Mango Meltdown Really Work? African Mango Meltdown says that thousands of people are using their diet pills to lose weight and get the body they’ve wanted. If you’ve missed the hoopla surrounding African mango it’s an extract from a special mango fruit that is supposed to help you lose weight naturally. Dr. Oz started the whole craze by talking about it on his show, and the rest is history. All-natural weight loss supplements are in high demand these days because people want the effectiveness of a diet pill but they don’t want the adverse side effects that come with many man-made synthetic ingredients. Having to take a weight loss pill that has a lot of stimulants is almost as bad as being overweight, so it’s often a choice between two evils. When companies come out with these fruit based solutions like raspberry ketone or acai berry the promise is that you’ll be using something that comes from the Earth and therefore is beneficial to the body in general. Some of the more enticing claims about African Mango Meltdown are that you’ll not only be able to lose weight, but you’ll be able to do it quickly, you’ll have more energy, the fat that you lose will come from your midsection, you’ll feel less hungry, and it will rev up your metabolism. Of course these all sound wonderful to anyone that’s tried to lose stubborn fat from their gut and other troublesome areas, which is why you have to take it with a grain of salt and try to keep your expectations at reasonable levels. Dr. Oz has a way of featuring things on his show without actually featuring them at all. He sort of hints at benefits, or makes allusions without actually making a claim that he would later have to stick to. But just the mere mention of a possible miracle solution on his show and people hit their favorite search engine to try to find out what he was talking about. It’s important to remember that talking heads like him always have an ulterior motive, so be sure to do your due diligence before getting swept up in the buzz. If you want to try just one bottle it’s $40, they’ve got deals when you multiple bottles at once, and they give you slight discount if you agree to sign on for monthly shipments. The way they have the ordering process set up is very clear and straightforward, which is refreshing after so many companies try to dupe you into high shipping fees, phony guarantees, and automatic shipments that you weren’t aware you were signing up for. This is just one more sign that they’ve got a product that they’ll stand behind and that they believe in. Even though the weight loss is supposed to happen rather quickly, if you have a lot of weight to lose you’ll need to stick with this as long as it’s working for you and the pounds are coming off. It would be a good idea to get a body fat scanner instead of using just the scale to tell you how you’re doing. That’s because it’s supposed to be helping you burn fat, so you might be disappointed in what the scale says, but happy when you see that you’ve dropped a couple percentage points from your total body fat numbers. There are several products on the market that offer similar claims and are priced just like African Mango Meltdown. In fact we have an entire page dedicated to African Mango reviews. When figuring out which one to go with you not only want to go with one that has lots of positive reviews, but also with one that is dedicated to using quality ingredients. In this case you’ve got a product that not only receives good peer reviews, but it’s also been highly rated by critics as well. This will increase the likelihood that you’ll have success with it, but there are no guarantees. Since everyone’s experience is going to be different with a product like this, they have a 30 day money back guarantee in place, and it’s the kind where you can try the product as much as you want during that time and still return it without a hassle. This is important to note because other African mango companies will not give a guarantee like that, and will only allow you to return unopened containers that you ordered in bulk. African Mango Meltdown is getting our Thumbs Up review and should make it onto your short list of natural diet pills to try out. You won’t really know how well it works for your personal situation unless you try it, but if reviews are anything to go buy this should be something that gives you results. We always recommend using weight loss pills as a catalyst to a new, healthier lifestyle. It can be hard depriving yourself of your favorite foods, and to deal with the hunger pangs and cravings that come with it. But if you start a new exercise program and start making better dietary choices at the same time that you start using these pills it should help with the transition. You can then wean yourself off of the pills once you reach your goal weight, and by the time your new choices will have become habits and you won’t need to think about it any more. What do you think? Does African Mango Meltdown work or not? Does African Mango Plus Really Work? Does Pure African Mango Really Work? There are so many damn reviews about african mango that it’s impossible to do a thorough research. The upside of that is that you know people are buying them like crazy, but how do you know if it’s just the hype or if it really works when everyone on the net have their own opinions on it? If I were you I wouldn’t worry too much about these products. Just think of them as something that’s going to help a little on your weight loss efforts and nothing that’s going to make a drastic difference. At the end of the day you’ll lose weight if you exercise and eat healthy, that’s what matters the most.